Whether this often hilarious/often chilling play that moves gainfully from silly to serious to surreal is to become part of Mara Nelson-Greenberg's signature style remains to be seen. But the production now at the Vineyard Theatre under the direction of Margo Bordelon is a terrific and purposefully scary one that identifies the playwright as a fresh new voice in the theater. The play which premiered at the Humana Festival last season isn't perfect, but its flaw — mainly in flailing its message a bit too relentlessly — is more than neutralized by the sheer audacity of the writing. Also notable is the excellence of the performers who are all extraordinarily adept at defining their seriously fractured characters. 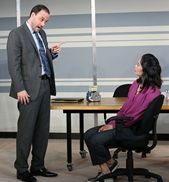 Reality gets severe jolt as Sofia (Tiffany Villarin) is hired to teach a class in empathy to the mostly male employees of a debt collection agency. Apparently the rule of thumb for them in dealing with the debtors has been to be openly hostile, unsympathetic and verbally abusive. The verbal abuse they dole out on the phone is nothing like their almost concerted physical assaults on the office's apparently sole female Eva (Megan Hill). We initially feel bad for the ever bright, almost giddy Eva as she relates to Sofia the constant barrage of attacks by the men in the office that she calls "muggings." She also appears to have learned how to fend them off with a scheme for survival that I won't reveal. Unacceptable behavior appears to be the norm as Sofia tries every rationale and accepted method at her disposal as a professional empathy trainer. That she must also get past the mentality and brutish impulses that rule this nearly maniacal man's world is not an easy job as the men have created a kind of revisionist language that suits their egregiously distorted work ethics. Neither the lecherous office manager Jon (Greg Keller) nor imbecilic workers Howie (Justin Long) and Jordon (Ugo Chukwu) seem at all aware of the colluding misogyny and misguided social skills evident in their torrent of vulgarity and the constant references to sexual intimacy. While Jon's politeness toward Sofia is obviously strained and not easily controlled, he can barely contain his own unbridled sexual instincts when in her presence. His demand that she change from pants to a skirt while conducting the class alerts Sofia that the issues here are more than just instituting empathy— a feeling that Sofia may herself be lacking when talking on the phone with her mother (Jeanne Sakata). Making an inroad in a challenging environment where the men are not only playfully antagonistic but inexcusably humiliating isn't easy. Sofia finds herself obstructed in every way in a world recreated and owned by men. The play is fueled by a flow of dialogue so rapid that it rattles the brain as well as the ear. But no less disorienting is how abhorrent behavior, most notably by the incorrigible Howie and Jordon, affects Sofia. There's a sharp detour as the plot gives both Eva and Sofia a chance to expand on their neurotically empowered personal narratives. One might be inclined to dismiss the more profound and complex theme of communication between the sexes in a toxic work place as we see a darker resolve emanate late in the play. This, as Sofia reaches for a humanity that appears tragically out of reach. Laura Jelinek's scenic design of a conference room is traditional until a climactic scene as stunning as is its revelation. If you've enjoyed seeing life refracted on the stage through the cleverly skewed absurdist lens of Eugene Ionesco, Christopher Durang or David Ives, you can now enthusiastically welcome Mara Nelson-Greenberg to this wacky inner circle. Cast: Tom Aulino (), Ugo Chukwu (), Megan Hill (),Justin Long (), Greg Keller (),Jeanne Sakata, Tiffany Villarin (). Running Time: Approx. 90 minutes no intermission. I agree with the review of Do You Feel Anger? I disagree with the review of Do You Feel Anger? The review made me eager to see Do You Feel Anger?